Picture from gerrym : anyone for golf? A small hill at the most northern reaches of the isle - surely not worth bothering about? Think again as i have. It provided a fantastic environment for walking and exploration, with religion, technology, stunning scenery and isolation as companions. Access is from the R242 out of Malin, turning on to a minor road, taking a lane off this at 436574 E and parking at its end where there is room for several cars (448577 F). This is at a height of several hundred feet and looks out over Malin and the ocean to the north. Cross fence and drop down to the dramatic coastline. The tide was out and the cluster of the Garvan isles just off the coast were fully visible, further out i could make out the lighthouse and abandoned dwellings on the island of Inishtrahull. Gulls perched on the cliffs and a solitary fishing boat braved the waters. A sheep track sticks faithfully to the cliff edges, passing storm beaches (one with a splash of sand which looked like a murder scene marked out for some large aquatic animal), small streams before they tumbled below and the large stack of Stookanuddan. Contour around an inlet, which has 2 streams falling at its back to jumbled slabs of rock below, to reach above the small stack of Reaghillan (458579 G). The ground rises steadily from here and the cliffs get higher, giving fantastic views over the immediate coastline and to Knocklayd in the Antrim hills further afield. My GPS gave the cliffs a height of 623 ft before i turned inland towards the summit. The hillside was covered in blooms of pink heather, with bees and butterflies visiting. A number of old tracks were visible to the east and a burnt out car - though had to look hard to spot it! The final pull is steep. The trig pillar and small cairn are reached in an hour and 2 miles. 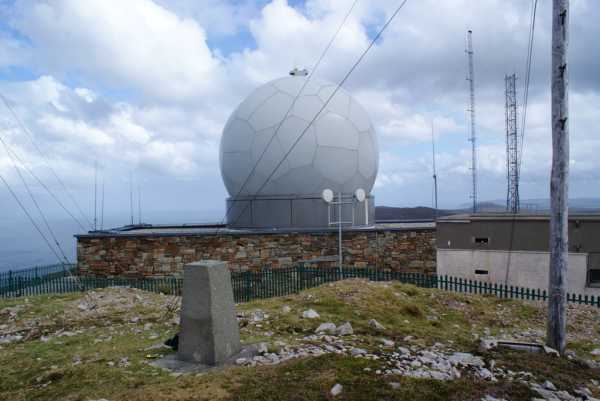 It is somewhat lost among masts and a large 'golfball' dome housing radar. The views are not lost though and stretch along the north coast to the antrim hills, west to Malin head and down over the hills of Inishowen to the Sperrin mtns. A strong breeze was blowing and i sat with my back against the trig pillar gazing over the Atlantic.